When it comes to skateboards, everyone wants something that is light, easy to carry, durable, portable, cost-efficient and yet delivers superior value to the rider. Well, all this has been made possible by the introduction of penny boards. 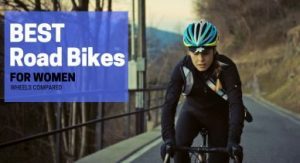 They are light in weight, decently priced, durable and fun to ride. 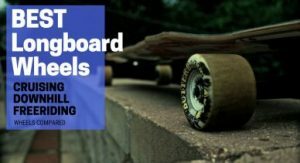 So, if you are tired of your traditional heavy and big wooden skateboards then just read through this article to find the perfect penny board for yourself and buy it right away. 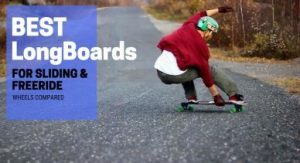 We’ll be listing the ten best penny boards, reviewing them in detail and after that, you’ll have a buyer’s guide to make the final and right decision. If you don’t wanna get into the details, then jump straight to our top three picks of penny boards. 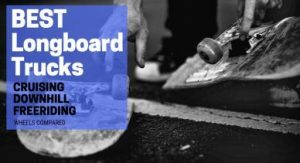 With that said lets have a quick look at the TOP 3 Best Penny Boards after that I’ll be reviewing each of the board one by one discussing their pro’s and con’s. Also to make it easier for you to choose the best we’ve got a Comparison Table and Buyer’s Guide. So without any due lets get started. Why use a penny board? Q: Are penny boards waterproof? Q: Are penny boards suitable for kids? Q: Are longboards available in the penny boards? Q: Will the feet slip on the plastic deck? Q: Can I ride my penny board in the rain? Q: Can I replace the wheels of my penny board? Rimable has always been a favorite of those who are pros when it comes to skateboarding. But when it comes to beginners, it is no exception; in short Rimable skateboards have become favorites of everyone who gets into skateboarding. And now it comes down to Rimable’s penny skateboards which certainly keep up the name. Maximum weight capacity: 198 lbs. The Rimable Complete penny skateboard is a combination of good quality and affordability. It has a 22-inch long deck that is made of good quality plastic which makes it extremely easy to carry around with you on camping, picnics or wherever you want to. The 3-inch trucks are made of solid aluminum and give the penny board a capacity of carrying 198 lbs. of weight. It is really amazing how a super light about 3.5 lbs. Penny board can support so much load. This is what penny boards are all about… Right! The wheels used on the Rimable Complete are smooth Polyurethane wheels that will give you a very smooth ride. What is better is that you will have a number of options to choose from when it comes to the looks of the board. The Rimable Complete penny board is available in so many different styles and patterns too. When it comes to price, this is an extremely affordable penny board, but that does not mean that the quality is compromised. It is very durable and will withstand a rough ride too. The only thing that might bother you about this board is that it does not glide as far as the other boards would. But, I can bet that once you start riding this one, this little con wouldn’t matter to you. The Rimable complete penny board, as the name states is a complete board with all the features, styles, affordability and durability that you would ever wish for. So, if you want to try a penny board, then this one is a great option to start with. If you want a small board that has looks which will turn heads, then the Skatro Mini Cruiser is the one. Skatro Mini Cruiser is our favorite when it comes to looks. It is sure to turn heads because of its Gold aluminum trucks. This one looks really royal with the black deck supported on golden trucks and patterned marble wheels. The plastic has been used on the deck with great precision hence, providing the perfect flex while riding. Instead of the traditional carbon steel bearings, Skatro has used their own made special steel bearings which increase the durability. The wheels are urethane wheels. 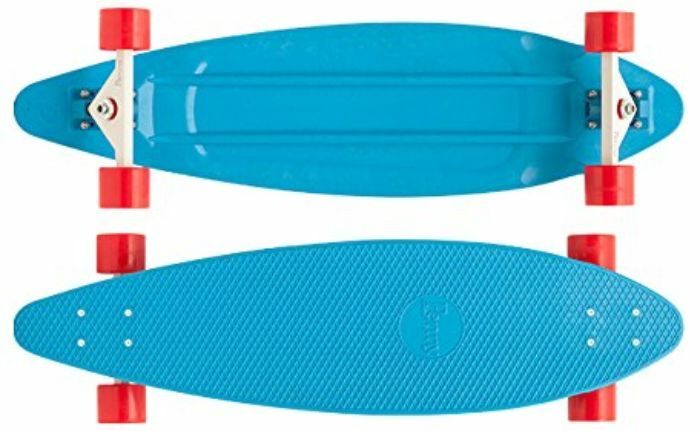 This penny board is great when it comes to cruising; that is why it is called a mini cruiser. This goes without saying that mini cruisers are the same as the penny boards. So you can just put it in the back of your car or in your bag pack and cruise around whenever you feel like and have all the fun. I reviewed this one with extra caution because you know looks can be deceiving at times. LOL! But, I was surprised that even with such a decent price it had almost no flaw. Still, if I must mention something, it would be that for some of you the trucks might need some loosening. So, if you are finding it difficult to take turns, then you can loosen the trucks a bit, and everything will be fine. For those of you who are into cruising but don’t want to carry around a heavy skateboard, the Skatro Mini Cruiser is a real deal. The cherry on top is its looks. So, I assure you that this will be worth every penny you spend. Many people want a bit long penny board but can’t find one easily. But Penny Complete has got you covered with their Penny longboard. Let’s see what we have in store with this one. The ordinary penny boards are mostly shorter in length than the skateboards, so some people find it uncomfortable and want a penny board that is a bit longer. Well, why not! Longer boards are definitely more stable and make the riding easier because the foot placement is more comfortable. Here’s the good news Penny boards have designed their first ever Penny complete longboard, and this is the only Penny longboard on our list. It is a complete penny longboard with a 36-inch long deck which makes it very stable, and it will be perfect for those who have just entered into skateboarding. The trucks are 7 inches and have the reverse kingpin with 83 A PU Wheels. This longboard has a pintail shape which makes it ideal for cruising and performing tricks too. And it is extremely light too weighing only about 3 pounds. What I personally like about this board is that it balances quite well and glides very fast which makes it extremely fun, safe and easy to ride. 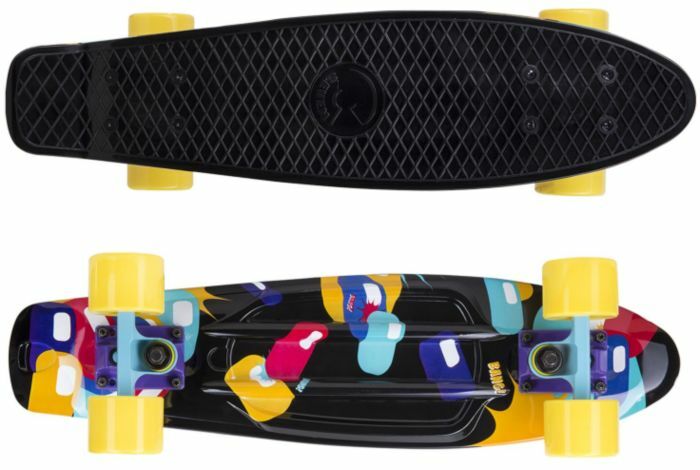 I honestly could not find any con in this penny longboard, and I think for this price one can definitely not complain. But, still, if you are not fond of longboards, then you can go for the other penny skateboards in our list. All in all, this is a perfect penny longboard and lives up to its name. You will not be disappointed with this one as it will be worth every penny. The Ridge 27 inch penny board is the successor of the original 22 inch Ridge skateboard. It is therefore also known as the Ridge big brother cruiser, and of course, it is better than its little brother. 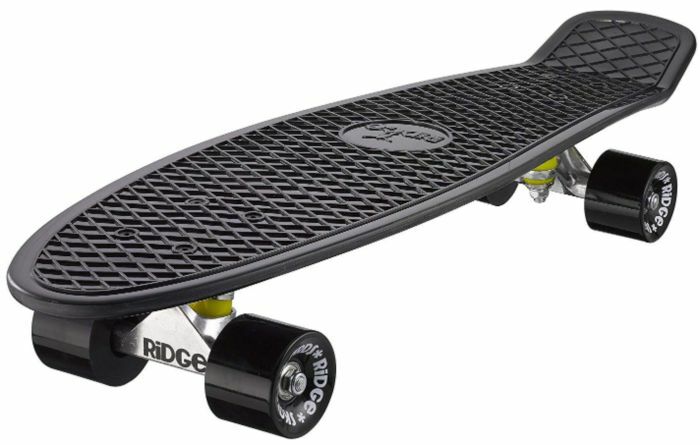 The Ridge 27 inch penny board is high quality and high-performance penny board. It is made of a very good quality plastic which also adds to the performance of this board. 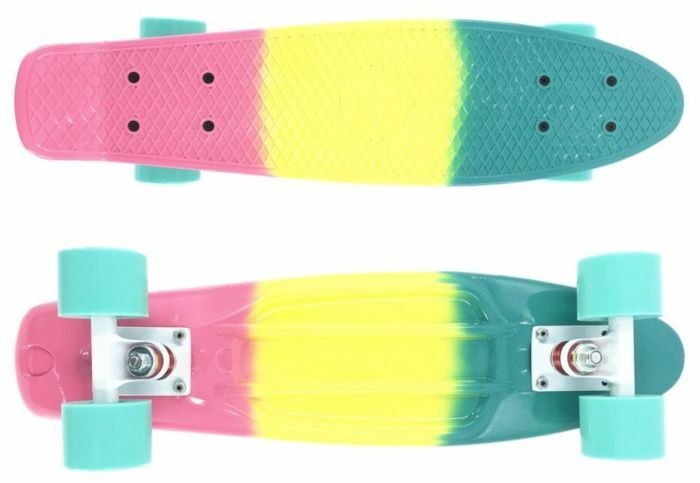 What I personally liked about this penny board is the wheels. They will give you a very smooth ride even on uneven and rough surfaces and also these will last longer than the other wheels. Other than that, Ridge skateboards provide you with many different colors to choose from whether it is the color of the deck or the wheels. So, you can play with some funky colors if you want to. Normally, Ridge skateboards are of good quality, and you won’t find a problem with them. But as this one is a penny board so it might not withstand too much load. Therefore, I will give you the advice that if you are over 150 lbs. Then go for some other penny board that can support that much weight. But if you weigh below this limit, then you are good to go. Ridge 27 inch cruiser board is very good when it comes to the performance and quality. For cruising, it is an ideal penny board, and it will be fun to ride with the variety of colors available. The Cal 7 Mini Cruiser is the most affordable board on our list. So, if you want just to get a taste of penny boards and don’t wanna spend much, then you can go for this penny board. This mini cruiser has a plastic deck that is 22.5 inches long and 6 inches wide which makes it quite easy to handle and carry around. The trucks are made of aluminum alloy that does not rust fast. It is extremely cheap that means that the components will not be that much of high quality. So, if you just want to test a penny board and use it for cruising only, then you should buy it. This one is not that durable when it comes to rough and tough situations. Another thing is that you will have to loosen the trucks a bit for taking smooth turns. So, you should adjust them to how you find it comfortable. The Cal 7 Mini Cruiser is a cheap and very light penny board that can be used for cruising. But, for rough and tough riding I would recommend you to buy comparatively expensive penny board like the Skatro Mini Cruiser which is still very affordable. The wonnv Retro mini cruiser is all about funky looks and sleek and smart design. 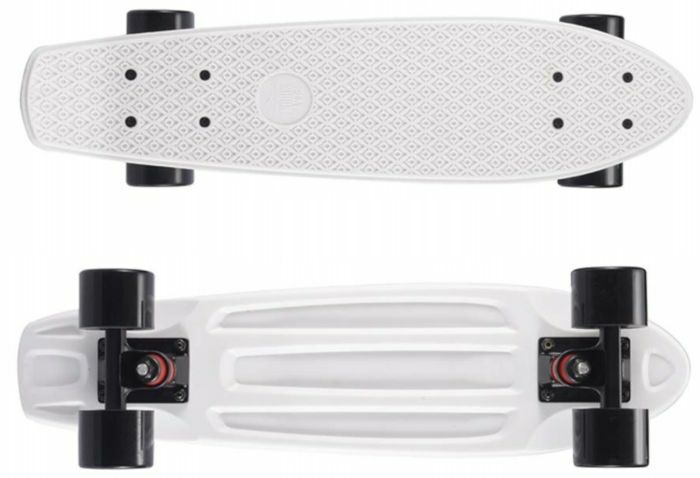 It is one of the least priced penny board on our list. Weight carrying capacity: 220 lbs. Some people might complain about how simple most of the penny boards are but when it comes to wonnv Retro Mini Cruiser that is certainly not the case. I am personally in love with the three different themes of this board especially the design which is a combination of floral ethnic patterns and bright colors. So, if you want to show off your new penny board, then the Retro Mini Cruiser will definitely do the trick. 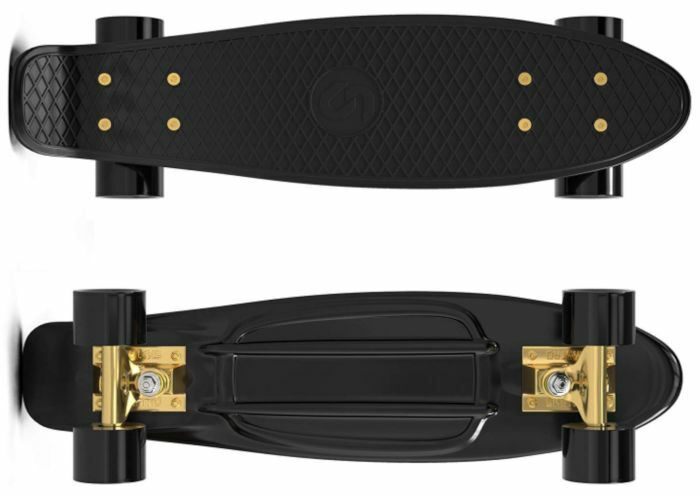 It has the same dimensions as the Rimable Complete penny board, and the wheels are made of polyurethane. The trucks used are the professional ones made of aluminum, and the bearings along with the trucks ensure a smooth and speedy ride. You can cruise around on it as much as you like and wherever you like because you can easily carry it around thanks to its lightweight. Some people might find a problem with the bearings, but you can always replace the bearings for just a few dollars. Moreover, you can also upgrade the wheels, but that comes down to what you prefer. 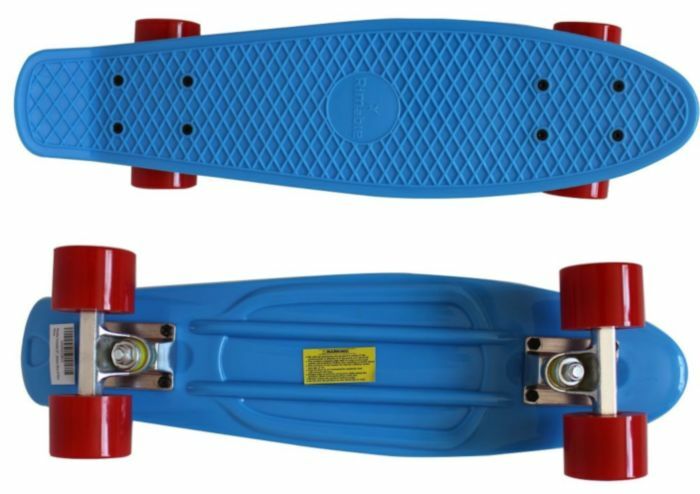 If you want a penny board that is light, cheap and has good looks, then you can really go for the Retro Mini Cruiser Complete Skateboard. This mini cruiser is great for kids teens and adults. It is made of high-quality materials and components. Also, this one is relatively faster as compared to other boards. The Playshion Mini Cruiser has a 22 inches long and 6 inches wide deck. What makes this deck special is that it is made of a combination of Fiberglass and polypropylene which make it very sturdy and durable. The trucks are made of professional aluminum and bearings are ABEC 9 which boost the performance of the board. This one is also available in a variety of different colors. The weight carrying capacity of this little board is 220 lbs which are great. The age limit for this one is 3+ which means that it is suitable for kids as well as adults thanks to its moderate size. The issue with this one is that it is stable, but it does not produce the required flex. Other than this, you will have to adjust the bearings and truck as to your preference either by loosening or tightening them. For the price, it is quite a decent board. It is available in many colors so you can have fun with the colors and the deck material is also different from the other penny boards. Now, that we have a set of options, we have to make the final purchase decision and choose one penny board. 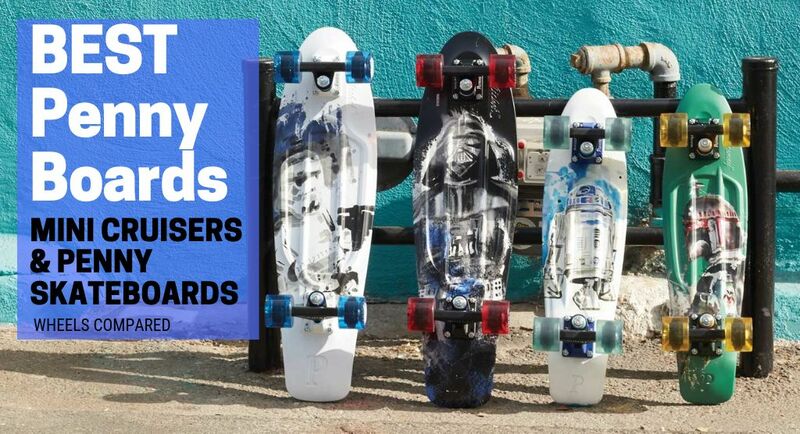 To further help you with your decision and make each penny count, we have a buyer’s guide that will help you in choosing the right penny board for you. Let’s get started with it. If you are more heightened or have slightly bigger feet or if you simply feel more comfortable and stable on a longer board then you should definitely go for a penny longboard. But if you can get used to a relatively shorter board and if you are a pro at skateboarding then you will be good to go with the penny skateboard too. At the end of the day, it all comes down to what you find comfortable. Well, mini cruisers are the same as the penny skateboards, and there isn’t any marked difference in them. Therefore, you can choose either one as per your liking. When it comes to penny boards, its all about affordability. Penny skateboards are the most affordable skateboards you’ll ever find so the price won’t be an issue. That is why, if you are just getting into skateboarding and don’t want to spend hundreds of dollars right away then penny boards are where you should start with. All the penny skateboards in our list are very affordable; the least priced are Cal 7 Mini Cruiser and wonnv Retro Mini Cruiser 22 inch Complete Skateboard. If you are a fan of colorful and stylish penny boards, then we have got some amazing and affordable options for you. Let’s start with the first one that is the Rimable penny board, it is available in plain colors too and differently styles and patterns too. Skatro Mini Cruiser and wonnv Retro Mini Cruiser are my personal favorites as the Skatro is decent yet gives you royal feels and wonnv Retro is all about colorful and stylish yet ethnic patterns. Whereas, if you just want a simple penny board in your favorite color then you will find many other options in our list too. Firstly, penny boards are great for people who are learning to skateboard or have just entered into skateboarding. And people who want to learn tricks can use them as these boards are more stable. Whereas, it is quite difficult to start with skateboarding and board tricks with the traditional big and heavy, wooden skateboards as they are difficult to handle. Another benefit of using penny boards is that you don’t have to be conscious of water contact as these are made of plastic and water won’t be a problem. So, you can enjoy riding penny boards even in the rain, and you can go over puddles and water-filled holes too without any extra care and all. This will allow you to focus on only your ride. Another benefit of using penny boards is the commutability and portability. As these are extremely light and small, so you can even carry them in your bag pack and ride them whenever or wherever you want to. A: Yes, penny boards are waterproof. This is one of the major advantages of penny boards that these are waterproof. Unlike traditional wooden skateboards, you don’t need to worry about penny boards soaking in the rain. These are more than suitable for people living in areas where it rains more often like Florida. So, with penny boards you can enjoy cruising in the rain, riding over puddles and potholes without any worries. As for the trucks you have to ask your company if they are water resistant or waterproof. A: Most of the penny boards are suitable for kids too, and almost all the penny boards in our list can be used by kids and adults too. It is because penny boards are smaller than the wooden skateboards. Still, it might vary from company to company so you must confirm the age limit from the company you are buying your penny board from. A: Yes, penny longboards are available. We have included one in our list too that is the Penny Complete Longboard. A: The penny boards have a plastic deck, but the deck has patterns on it that won’t let your feet slip on the deck. Some penny boards have a honeycomb pattern carved on the top of the deck whereas others have a waffle top. In short, the pattern might vary from company to company, but each penny board has a top that is designed in a particular way so that your feet can sit firmly on the plastic deck. This goes without saying that you should always wear the safety gear while riding any skateboard. A: Of course, you can ride the penny board in the rain as this is the main advantage. As already mentioned, penny boards are, and therefore, rain won’t affect them anyway. A: Yes, you can replace wheels of your penny skateboard. But, you will have to see if the wheels you are installing fit in your penny board or not. Nevertheless, you can always confirm from your respective company as some companies might provide or suggest which wheels will be better for the upgrade. 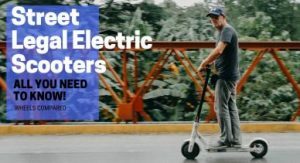 I hope this article was helpful and helped you but the right penny board for you. I have answered many of your queries in the FAQ section but if you have any other queries feel free to hit me up in the comments section. And don’t forget to share your experience with penny boards in the comments section below. Feel free to give any suggestions if you want to. Have all the fun cruising around on your penny skateboards because at the end of the day it all comes down to having fun with whichever one you buy.